Welcome to our newsletter about home improvement questions. Dan, my brother and webmaster, asked me to make a fun little construction quiz for the site, which you can find as the first article on our site as Basics 0: Construction Quiz. Please let us know what you think of it! I have been busy answering questions and revising plans. Thanks for your emails! Checkout our new section: Feature Article of the Month, taken from our website, of course. To help hold up a set of stairs when the box joist is not large enough, install a plywood riser onto the stringer and onto the riser. Hi Vanya and thanks for your email. I am familiar with Cyprus, only to location and a bit of your history that was shared with Canada during her peacekeeping role there, years ago. I live on the West Coast of Canada, also on an Island, Vancouver Island, North America's largest, about 300 miles long and 100 miles wide. We are very aware of humidity here, although maybe not to the extent of Cyprus. Our knowledge of humidity includes the need of air movement in the home. We have air exhaust fans in the bathrooms, the room of greatest humidity, as well as in the kitchen, over the range in a hood. In British Columbia, my province, it is required by the building code to install at least 1 higher quality fan with a lower noise level, usually in one of the bathrooms in a central location that is automatically operated by a dehumidistat. This is inserted in place of the fan switch on the wall and is set to a certain humidity. If the humidity is greater than selected, the fan is switched on and the humid air is forced outside through ducts and vents. This is the basic requirement. We also have the choice of installing a heat recovery ventilation system (HRV) with its own central fans and heat recovery core, separate duct system for fresh air and exhaust air to and from each room of the house. I built my house in 1992 and chose the HRV system which changes the air in the entire house every couple of hours. Without it we would have moisture build up on the windows, etc. During the mild winters here, we have 100% humidity outside when it is raining, we don't seem to have any problem with our system with the continual air exchange. We have aluminum windows which weep and cause black mold in the bottom drainage troughs, something we need to clean every Spring. Other than that, our house is relatively free from excess humidity, in the Winter. Our new homes are very air tight and well insulated, so we need to keep the air inside constantly moving. Our attics have air movement in them just from placement of roof, gable, ridge and soffit vents or wind, or electric operated ridge fans. We have learned to keep storage items away from outside walls in the basement, for example, to allow air to move around the objects. If air ducts go through cold spaces as in attics or crawl spaces, they are insulated to prevent condensation. I hope these tips will give you some ideas of how to cope with your condensation problems there. I sense your concerns on the large landing and rightfully so. This could be an ideal place for smokers, etc. in the middle of an event, where large groups of people could congregate. I am not an engineer either, but I have learned over the years about the structural properties of wood. End grain crushing strength of Douglas fir is about 500 psi (pounds per square inch). So a rough 4x4 with 16 sq. in of surface area would support 4 tons. End grain crushing strength of Spruce is about 300 psi. It is important when designing with loads like this is not to depend on nails or bolts to support the weight. That is, always try to support the weight on the end grain of a post or if a ledger is attached to the side of a post, as in your case, to support it with a member under the ledger to the base of the post. I noticed in drawing 1 of 3 at the intersection of the 9' x 18'-6" landing at the outside corner of the ramp there is a post missing. This beam (1 of 3) should have its own post and not shared with the post from the ramp beam. If the landing is attached to the building at the door and at the ramp, it should be secure from any lateral movement. I suggest you run this by the planning engineer for his opinion. It is good to get the input from the building inspector, but on this point you should talk to the engineer on staff for his opinion. Tell him your concern for possibly a heavy load from people congregating here and what he thinks about it. He obviously won't design your project, but I've found with working with these guys they usually are willing to share info. For a house deck, usually 6x6 posts are suggested sitting on 8" or 10" concrete posts (formed with sonotubes) with their base below the frost line. A post saddle embedded in the concrete holds the post in place. Here you may experience far more weight than a simple house deck. A few years a home deck collapsed down a cliff when a family had a gathering with a large number of family members and friends. I think there was one death and numerous injuries. You want to avoid something like this. Once your plan is approved by the building dept. your liability should be on their shoulders, maybe something to look into. Pressure treated wood is usually hemlock, so close to the properties of fir. The ramp looks good, other than a middle handrail and toe rail. See my ramp plan: https://daveosborne.com/dave/projects/wheel-chair-ramp.php. The middle handrail is used by the person in the wheelchair to grab a hold of and pull himself up the ramp. 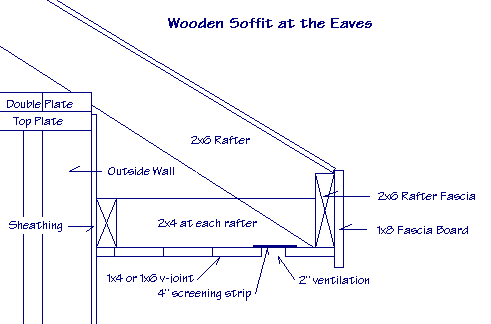 Please give detailed instructions on how to install wood soffit. This is being done to a building which is historical. The existing (old) soffit was wood and the new soffit, fascias etc must be as well. Here is a drawing of a typical wooden soffit, done from 1900 to the 60s or 70s before aluminum took over in popularity. The rafter fascia should be installed at the framing stage. Install a 2x4 at a height matching the bottom of the rafter fascia and nailed into the studs through the sheathing (sheeting). Then fasten a 2x4 between this ledger and the rafter fascia at every rafter, 16" centers are best for 3/4" thick boards. The soffit material usually was a cedar V-joint 1x4 or 1x6. Notice the ventilation strip which was simply a 2" space between the boards with a 4" wide strip of screening material stapled to the cross 2x4s in the correct position. Another option for ventilation was to drill holes in the board and fasten screen behind the board, before installation. Depending on the age of the building, the fascia board was as shown in this drawing or fancied up either with scalloped cutting of the bottom of the fascia board or the addition of crown or cornice molding. Hope this info is what you are looking for. If not, just ask more specific questions. I have a full basement house with 2"x 10" floor joists. I have real ugly ceiling tile on here that I plan to rip off and redo with drywall. The basement is heated though I usually have the heat turned off for the majority of the winters to save energy as the basement is used only occasionally. My question is should I install insulation batts between floor joists to make the upstairs easier to heat and save energy? Yes, this would help with saving heat upstairs. Insulating these floor joists would also help to sound proof the different levels. Don't put any vapor barrier on the joists, just insulation, in this case. Dave, I need help laying out 45 degree return stringers for deck stairs. The 5 step stairs (6.75 inch rise/9.875 inch run) return from the main center section at a 45 degree angle. The center section measures 15 foot across. The top step on the 45 is 12 inches across. I understand the 90 degree return process, but can't figure out the 45 degree returns. Any help, or reference material would be great. If you come straight out at 90° from the deck, then go off of those stairs at a 45°, you have a very narrow run on these stairs, around 7". Is this the problem you find? That is why I show how to build stair returns by mitering the angle rather than coming off the center stairs on a 45. Here is a drawing. Is it what you are talking about? You can vary the 15' distance, but not the 63.75 distance. I made the run on the main set of stairs to 12.75 so you could get at least the minimum run of 9" on the 45 section. For the 15' to be the overall width, you need to have the main set of stairs only 52.5" wide. This drawing is close to scale so it should give you a realistic idea of what you are up against. We all have gotten a new power tool once upon a time, but how many have read the instruction manual that goes with every new power tool? How many of us have turned the page over to the operation instructions and ignored the safety instructions? Let's review some of the safety concerns involved in handling power tools that are capable of removing limbs. Not tree limbs, I'm talking about your limbs. The ones you have looked after so well up to this point in time. Delta Power Tools and Makita Power Tools rate, "Know your power tool", as their number one pick for safety concerns. Well that's it for another month. Thanks for the emails, comments and questions. What do you think of our new format? Please let me know!